Facing the South China Sea, these massive windmills are a thing of beauty and functionality. 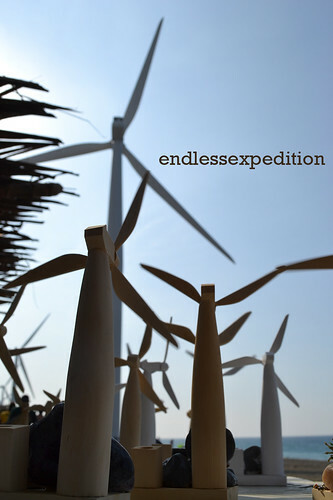 Being the windiest part of the Province of Ilocos Norte, 20 gigantic white windmills were built and erected along the shores of the Northern Town of Bangui. Bangui is the second to the last province of Ilocos Norte to the North just before Pagudpud. 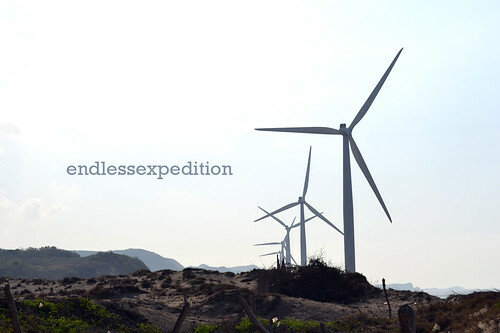 The Windmills of Bangui or formally known as the Northwind Bangui Bay Project converts natural wind energy into usable electric energy which sells electricity on almost 40% of the energy consumption of the whole province of Ilocos Norte. 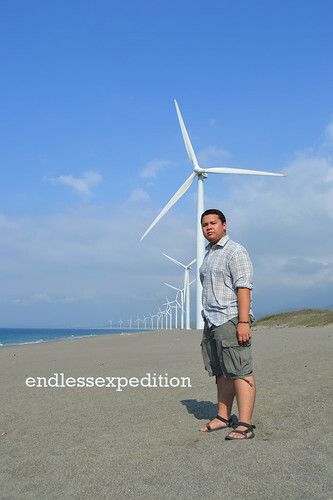 This is the very first and currently the only "Wind Farm" across the Philippine Archipelago and also the biggest in all of South East Asia. Getting to these Magnificent place from Laoag City, ride a Cagayan-bound Bus (Tugegarao, Appari, etc) via Burgos. Upon reaching Burgos after more than an hour, be careful and stay tuned at the left side of the road until you see the marker that says Bangui Bay. Before reaching this part of the road, you are sure to see a number of these wonderfully made, humongous windmills. Then upon seeing the marker, follow the path leading to the Bay until you reach the shores. This Mini wooden windmills that actually work are sold for a very cheap price of Php 60 - Php 300 depending on the size. Some ranges from 7 inches to around 2 feet. Make sure to grab one by the time you visit the Mills but be careful since the saddles of these windmills are quite delicate. but since it is made of wood, you can easily readjust the fins and make it spin normally again. It was my second time in the Windmills during my last Ilocos trip this April 15th yet it still brought me back to that "first time" feeling because of its beauty. It is not just the windmills itself but where they are placed gives me this magic feeling as if I am part of a Music Video that came to life. By the very first sight of these wonder, I placed my earplugs on my earholes and sttarted playing You and I by Park Bom because this is my Soundtrack for this place. Hahaha Yes! I always have soundtracks for every place, every moment and every feeling of my life. Maybe I should add this segment to my future posts? What do you guys think? I have been to Ilocos around 5 times but have seen the windmills just twice because it has not been erected since the year 2005. But right now, I can really say that this is my favorite spot not just in Ilocos Norte but in the whole of Northern Luzon. Seeing these for the very first time on a Philippine TV Tourism Ad brought me chills and I suddenly went to our slow internet connection and searched about it and found out that it is real! By the way, I have installed reCaptcha to regulate post comments. If ever you enjoyed this post, please do leave a comment, I miss reading such (not the Spams though). Windmills are my most favorite structures together with Lighthouses ever since I was a child. Windmills make me feel I am part of Nature. Windmills make me feel like I am in the Netherlands. Windmills make me feel very lucky to have eyes to ever see such beauty that is truly functional as well.